A local toddler may have died of secondary drowning after swimming over Memorial Day weekend, according to his family. TEXAS CITY, Texas -- The family of a little boy says he died after a swim at the Texas City Dike over the Memorial Day weekend. Francisco Delgado III, 4, passed away Saturday at East Houston Regional Hospital despite efforts to resuscitate him. His parents sat down with Eyewitness News on Tuesday. They call Francisco "Baby Frankie" and said he showed signs of an upset stomach shortly after swimming, but they didn't think much of it. He seemed to be getting better and was still a fun-loving kid. On Saturday morning, his father, Francisco Delgado Jr., said his son complained of his shoulders hurting before suddenly waking up hours later. "Out of nowhere, he just woke up. He said ahhh," said Delgado. "He took his last breath and I didn't know what to do no more." His mother, Tara Delgado, said paramedics and doctors tried to save her son. "I walked in. I could see him lying there. They were still working on him. I'm screaming, 'Let me just touch my baby. Maybe he needs his mama's touch,'" said Delgado. "When she came in, she told us it's what's called dry drowning. His lungs were full of fluid. There was nothing else they could do for him." 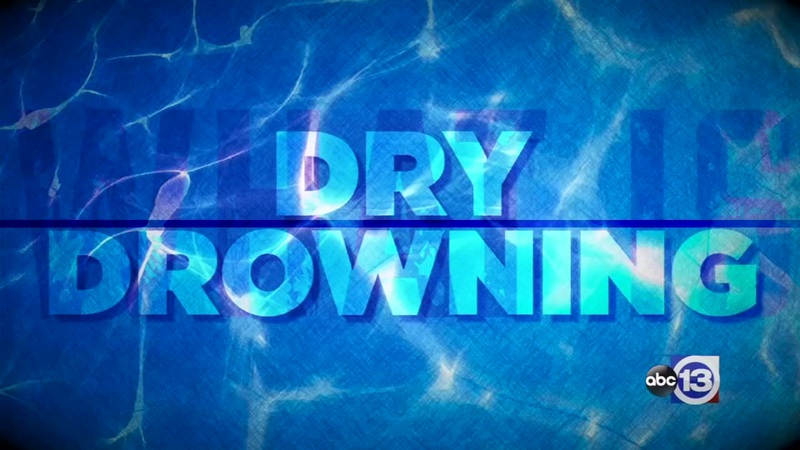 VIDEO: What is dry drowning? Dry and secondary drowning are potentially tragic medical emergencies that can occur even after a swimmer has left the water. The family has created a GoFundMe account to help cover funeral costs. They also will be holding a benefit at Texas Twister on Saturday, June 17 at 11 a.m. at 2327 McCarty St.
Services for Delgado have been set for this Saturday, June 10 at the Compean Funeral Home at 2101 Broadway St. The viewing is at 10 a.m. The funeral begins at 1 p.m.
An autopsy is being performed on the little boy. The medical examiner will determine an official cause of death. Dr. Kay Leaming-Van Zandt is an emergency medicine physician at Texas Children's Hospital. She is not connected to Delgado's case. She spoke with ABC13 about the dangers of drowning. She said she shies away from terms like dry or secondary drownings. Dr. Leaming-Van Zandt said children can drown in just inches of water. She also said it may happen hours after initial contact with the water. "Some children will have symptoms soon after the drowning occurs. Some children will have symptoms later on. They may seem fine. They develop respiratory issues hours after the event," said Dr. Kay Leaming-Van Zandt. "It only takes a split second. Drowning is silent. It's not similar to what you see in the movies where there is a lot of commotion."